Eyes. Attitude. Talent. These are lingering images we carry of the incomparable and truly legendary Bette Davis. Nominated for ten Oscars during her amazing career, Bette Davis both as an actress and force of nature pushed Hollywood to a new plateau. On screen she reinvented women’s roles. Off screen she fought voraciously for good scripts, decent treatment of crew members and, especially, for the control of her own career. Bette Davis became the first woman president of the Academy of Motion Picture Arts and Sciences in 1941, the same year she also joined forces with John Garfield to organize the Hollywood Canteen, a hospitality center in Los Angeles for our fighting US military men. From the mid-thirties to the close of World War II, she was the highest paid woman in America. The public adored her and never knew what to expect from her. She became so powerful at her home studio, she was often referred to as “The Fourth Warner Brother.” Some critics considered her style abrasive but her work was nevertheless innovative. To generations of women and aspiring actors, she became a true inspiration and role model. Even when her age caused movie roles to be fewer and less appealing, Bette Davis again took charge and did something no one had dared do before: she placed a full-page advertisement in Hollywood Reporter to resemble a want ad, saying “Situation Wanted: Mother of three, 30 years experience as an actress, more affable than rumor would have it, wants steady employment in Hollywood.” Her career soon took off again with Whatever Happened to Baby Jane, a role which garnered her a tenth Academy Award nomination. Unforgettable movie lines, delivered in her inimitable style, have long become part of our vernacular. 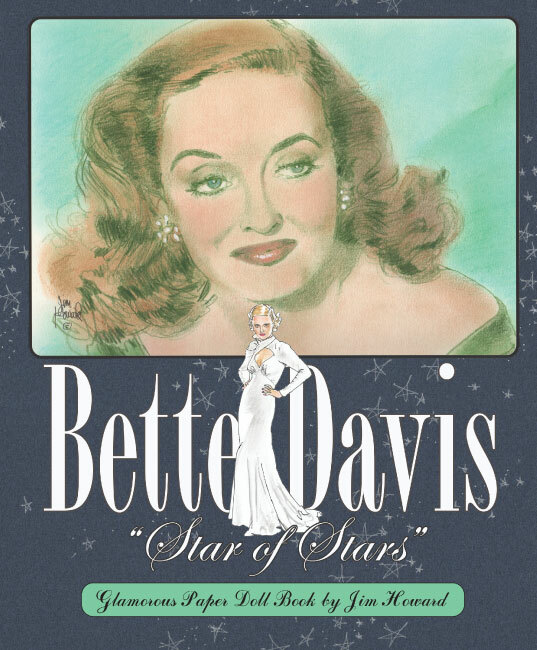 “What a dump,” “Fasten your seat belt, it’s going to be a bumpy ride,” “Let’s not ask for the moon, we have the stars” and “I’d love to kiss ya but I just washed my hair” will forever remind us of Bette Davis. Bette Davis never considered herself a fashion plate, and in fact, demanded that her costumes reflect the character she was portraying rather than glamorize her as a star. Nevertheless, her costumes, most often by Orry-Kelly, frequently made stunning fashion statements. In Now, Voyager (1942), her Cinderella transformation from frump to super-chic still inspires fashion designers today. This paper doll book by Jim Howard includes costumes from many of her most famous films, some contemporary and others from various historic periods. “Acting should be bigger than life. Scripts should be bigger than life. It should all be bigger than life,” she said. And Bette Davis was a bigger than life star.